Could a united Kurdistan mean a victory for the peoples’ natural resources: energy, and mighty rivers? Against the backdrop of the civil war raging in Syria, Syrian Kurds are moving towards self-rule. 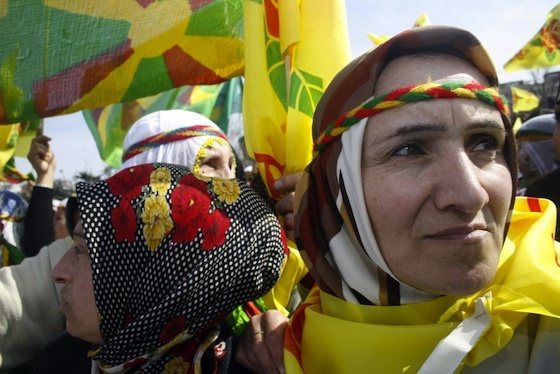 The Syrian government has relinquished many Kurdish communities to local control. Kurdish flags fly over former government buildings in northeastern Syria. Many new Kurdish language schools are opening up, something the Assad government had previously prohibited. There are an estimated two million Syrian Kurds living in communities near Syria’s northeastern border with Turkey. (Some sources say three million.) The civil war has excited Kurdish aspirations for statehood, dreams that have been thwarted ever since the Western victors of World War I drew arbitrary borders in the Middle East and divided Kurdish people among four countries: Turkey, Iraq, Syria and Iran. Across these borders, Kurdish areas have bountiful natural resources and a common identity, some of the primary essentials for nation-building. Iraqi Kurdistan is rich in natural resources such as oil and gas, and Kurdish areas in southeastern Turkey have untapped oil reserves with an estimated 270 million barrels, located mainly in the Hakkari basin. If united, Kurdistan would also be home to the source of the mighty Tigris and Euphrates rivers. But theoretically, a united Kurdistan would be landlocked, surrounded by the countries from which it recently gained independence. Iraqi Kurds have already experienced difficulty making independent energy deals with neighbors such as Turkey, without upsetting its relations with surrounding Iraq. Oil and water are both highly contented resources throughout the Middle East. And their distribution, or lack there of, has often been a contributing factor behind uprisings, ethnic tensions and societal unrest. The natural wealth of Kurdish territories has proven both a help and hindrance to achieving autonomy.